When the 4 week period is over what happens to the money invested? Do you reinvest the money along with the interest earned ? Also what kind of tax document do they provide (1099 etc) and does that show the details for all the investment made over the year? Though I have written on how to purchase T-bills through a bank account in the past, I never thought about a post on the complete process of T-bill investment until I read the above comments, which raise some basic yet practical questions about investing in T-bills (in addition to the rates). I feel the best way to answer these questions is to write an entry with detailed process for any one who is interested in investing T-bills but didn’t start yet. Before making a purchase, you need to link a bank account (checking, savings, or money market) to your Treasury Direct account in order to fund your investments. TD offers two ways to fund your T-bill purchase: a bank account or Zero-percent Certificate of Indebtedness (Zero-Percent C of I or C of I). For me, my HSBC savings account is linked to TD account. Actually, you can probably can use any account with an account number and routing number to purchase T-bills, not necessarily a checking or savings account, as they are required to open your TD account. Now that your TD account is ready and you know which account you want to use to make the payment, you can schedule your investments. To begin the setup, log in your TD account, then click the “Buy Direct” tab from the top menu bar and select Bills from the next screen. Submit your selection and you will be led to a new screen where you can enter details of how much and how often you want to invest, as well as sources to fund the purchases and receive principals and interests. The product term is 4-week and the minimum purchase amount is $1,000. Here you can add the bank account as your source of funds. You can choose either to make a single purchase or repeat investments and investment period and frequency. The starting date can be any date you want and the first purchase will be made on the next Tuesday, the auction day and fund will be withdrawn from your bank account two days later. The final step is to set up the destination to receive the payment once the bill matures. While you can use either a bank account or C of I as the destination of payments, sending the money to an interest-bearing account can make the most of your money. Since T-bills are sold at discount, what you pay is less than the face value of the bill that you will receive at the end of the period, with the difference being the interests. This means you will always have money left in your destination (you will have to keep at least $1,000 in your bank account since you won’t know in advance what the rate will be before the auction). If you use C of I as your destination, any money in it will just accumulate without earning your any interests. Of course, you can always transfer the money out of C of I, but sending the money straight to your savings account will make thing much easier. I use HSBC savings account as my destination. If you want to make continuous purchases, you can easily set up a T-bill ladder (choose Repeat Purchases) with as little as $4,000, $1,000 each week for four weeks. At the end of the first 4-week period, your first purchase of $1,000 T-bill matures and payment will be sent to your designated account. If you establish a T-bill ladder, another purchase of $1,000 will be made on the same day you receive the payment. Since purchase is always made after payment, you don’t need to worry there isn’t enough fund in your bank account. After the first 4 weeks, the investments will keep going until you cancel it or the scheduled number of purchases are made. At tax time, you will receive a 1099-INT form (Edit: actually the form is downloaded from your online account) with all the transactions made in the past year and interests earned. While investing in 4-week T-bills will give you a rate of return (this week’s rate is 5.267% APR) that no online savings account can match, you do have a little to give up: the liquidity of your funds and the minimum of $1,000 to start. Once you buy 4-week T-bills, you will have to wait 4 weeks when the bills mature to get your money (plus interests) back. This essentially locks your money for four weeks. Besides, if you want to build a T-bill ladder, you will need a minimum of $4,000. Finally, a word of caution. If you use a savings account to fund your T-bill purchases, you have to be careful not to exceed the transaction limits (usually 6 withdraws per month) imposed by your bank. Check with your bank before using your savings account to make purchases. Click here to calculate your equivalent yield. Very interesting! I may be tempted to do this. I don’t use T-bills for my cash — I put everything under a Tax Free Money Market account. I like the liquidity of that and so far because of the tax free status, I seem to make higher than most cash accounts. I recently opened a TD account. Done in seven days. Monday to Monday. I have had a TD account for a few months, and I’m pleased so far. Thanks for the calculator, BTW. I’m in the the process of making a T-bill ladder with my emergency cash reserve, since I can’t forsee a situation where I’d need all my cash (4-6mo expenses) in less than 28 days. That lack of liquidity is worth the higher return, IMHO. The only thing I don’t like about TD is the website, which is confusing. For example, you’d think that “linked accounts” means your bank accounts for funding/redemption. It doesn’t. They are other TD accounts you create for other purposes/people. Also, the most useful summary page is linked from the bottom of the My Accounts page, and not directly on the top menu (as far as I can tell). Actually, you don’t receive a 1099 in the mail. Your 1099 is available in your TD account after the first of the year, and you have to print it out for your files. SVB: I once took a look at Vanguard Money Market fund, and didn’t do anything since I don’t quite like their $3,000 minimum and fees if the balance is less than their minimum required. If someday I find the rate from the MM is not that good, the only way to avoid the fee is to close the account. However, with TD, start and stop T-bill purchase is very easy. For taxes, I assume your MM account only exempts state taxes, which is the same as T-bills. With T-bills, it’s much more flexible, in my opinion. Joe: I have already updated the page with your information. Ricky: In addition to online savings account, I also put a lot of cash in T-bills and am very happy with it. Though the money is locked for four weeks, as you said, that’s a little price to buy to get the higher return. Actually, only a quarter of the total invested money is locked for four weeks. If you are in a situation that you need the money, you can get a quarter of them back every week. So it actually isn’t that bad. Regarding their website, I found the most annoying one is that you sometimes just can’t hit the pageback button. Otherwise, you will get error page and have to log in again. Not very convenient. Annette: Yes, the 1099 is actually downloaded from my online account, not exactly received in the mail. I mentioned it from I replied to the first reader a couple of days ago, but somehow forgot in this one. I made the correction on the past. It just so happens that I have some old savings bonds that need to be cashed in. The SmartExchange feature is a feature that I was not aware of. Thanks for the informative review. 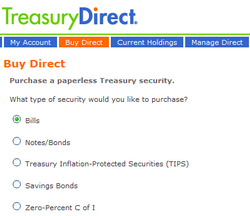 I opened a Treasury Direct account for my mother yesterday. Done in five minutes. I don’t know why Reader Joe’s account took seven days. He might have had to clear a hold placed on his account. TD logs you off if you use the back button. You will most likely be logged off a few times before you remember to only use the links on TD instead of the back button. I’m not sure I’m understanding this correctly – they sit on your (now uninvested) money for 4 weeks before you get it back? So once I get a ladder going I will have to have 7-8k out of my bank account to have 4k actually invested? Doesn’t that make the effective interest rate something more like 3.3%? I’m probably off here but thats what I got out of it. Bob: I just want to confirm with you the time between you complete the online application and the time you can actually use the account to make a purchase. I know the online process may take only several minutes, but you may need to, for example, get some kind of confirmation from TD which is usually sent to you by mail and that takes much longer time.Please let me know if this is the case. Chuck: Probably I didn’t explain it every well, but what you said isn’t how it works. Let’s say you have $8,000 in your bank account and you want to build a 4-week T-bill ladder by investing $2,000 each week (since 4-week T-bill is auctioned every week, you can indeed make a purchase every week. with other bills, you may not be able to do so). Then in the first week, $2,000 (actually less than $2,000 because of the discount) will be drafted from your bank where you still have the other $6,000. Next week, another $2,000. Your money will all be invested at the beginning of the four week when you have $8,000 in T-bills. At the beginning of the 5th week, your first $2,000 matures and it will be returned to your bank account. If you set up continuous purchases, the $2,000 will go right back to make next purchase. Thus, after four weeks, all your $8,000 will be in T-bill until you stop it or the number of purchases you set is reached. I am still confused. Does the TD exceed the return provided by Vanguard Tax Free Money Market? Thanks for a great post. Fred: The Vanguard Tax-Exempt Money Market Fund (VMSXX) currently has a yield of 3.50% and earnings from the fund are exempted from federal income tax. Assume a 28% federal income tax rate, the equivalent taxable rate is 3.50%/(1-28%) = 4.86%, which is lower than the current APR of 5.26% of the 4-week T-bill. Also Vanguard funds (other money market funds as well) has a fixed expense ratio. When this is taken into consideration, the rate is even lower. I think the T-bill makes very good sense for short term investment. I didn’t see any mention of taxes on the T bill. Is it tax free? I’m probably being dense. What happens to the interest that is thrown off? When you automatically repurchase, is it wrapped into the repurchase or paid out to you? 1. You make your $2000 purchase at it’s discounted rate (for argument’s sake $1990). 2. For a 30 day note, in thirty days you get $2000, PLUS the interest??? Or is the $2000 the [face value - the discounted rate], so the $10 between $1990 and $2000 would be the interest??? This is what I don’t get — what exactly is paid out. Is it like a savings bond? or like a CD? db: What you said is exactly how the T-bill investment works. Using your example, suppose that you have $2000 in your bank account that’s linked to TD and you make a purchase at discount and pay $1990 for the par value of $2000. So $1990 will be taken away from your bank and you have $10 left in your account. 4 weeks later, when the T-bill matures, you receive $2000 back and you now have a total of $2010 in your bank account. The $10 is the interests you earned by investing in the T-bill. If you continue your investment and the next T-bill rate changes and you need to pay, say, $1985 for a face value of $2000, the amount of money taken from your bank will be $1985 at the beginning of the 4-week period (now you have $2010 – $1985 = $25 in your bank account) and at the end of the 28 days, you will have $2025 in your bank. So what you earn is the difference between the money drawn from your bank and the money returned to your bank which is always multiples of $1000. Nifty guide! I just purchased my first t-bill last week, and my account was opened right away. yeah, I recently convereted most of the money held in savings account in t-bill investments. The extra money is worth it, but it’s important to have a good system in place so it’s not too much work. I’ve often thought about using schwab to t-bill investments then I wouldn’t be shuffling money around from an interest bearing account to the TD account. A common mistake I keep seeing by people using Treasury Direct is not taking advantage of the same-week roll over feature of the zero-interest account they give you to not lose a day of interest. So for example this week I’m buying $22,000′s worth of T-bills on in Tuesday August 21st 2007 with $22,000 from a different T-bill that isn’t actually maturing until Thursday August 23rd 2007. And I’m not using a time machine to do it. The trick is to set the destination account of the maturing bills and the source of the bills being purchased both to “your zero percent interest account”. As long as you do that, their computer understands and rolls it over for you without losing a day of interest. The reason why you have the zero percent interest account is to avoid wire delays and other bank delays in rolling over your cash. If you try to do a same-week roll-over using your own bank, account …you quickly find out your bank is too slow and things bounce. Pretty easy once you get into the swing of things, and then you roll up those interest payments into new $1000 purchases from your bank account. To do that, you just schedule the roll over from the zero-percent account in the Treasury Direct system as you have been, but then schedule *a second* purchase for the $1000 with a different source: Your bank account. The money will roll over as usual in Treasury Direct, AND you’ll have the purchase from your bank done as well the same Thursday. Set the destination of the new $1000 to be the zero-percent account, and viola, you’ll be able to roll it over with the rest of your cash without losing a day of interest same as the rest now. interest as the fund is always deposited on Thursday. Sorry, I’m totally new to this…can’t I sell T-bills before their expiration date? That way I’d have total liquidity. Lauren: I am not sure how to answer your question because I only bought 4-week T-bills before, not any other maturities, and I always held the bills to maturity (4 weeks). T-bills are themselves short-term investments with the longest maturity at 52 weeks. So they are supposed to be liquid. I have to look into it to see what happens if you sell the bills before maturity, but I would imagine there’s some kind of penalty.